The Magic Carpet Travel Conveyor is designed to provide convenient and efficient loading and unloading of unitized cargo. 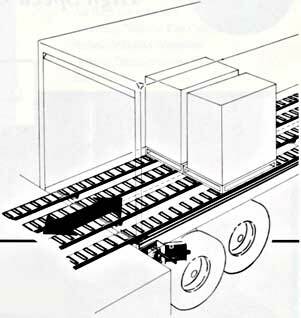 The conveyor features a hydraulic system to raise and retract low friction rollers, thereby offering cargo transfer and safe vehicle travel. The Essex System gives you Tailgate Service from dock to dock...or without a dock at all. Vertically retractable rollers make the difference.